Phillips Zoom DayWhite and NiteWhite offer superior at-home whitening for a visibly whiter smile in one day and your whitest healthiest smile in seven to fourteen days. They are the only at-home whitening products to contain amorphous calcium phosphate (ACP), which is clinically proven to reduce sensitivity, protect enamel and help improve the luster and smoothness of the teeth. 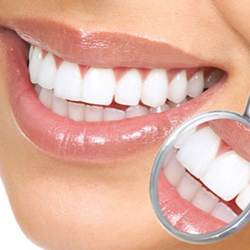 Zoom at-home whitening products are completely customizable. Dr. McGee creates a custom tray made just for you and can tailor the formula concentration and wear times to your sensitivity and lifestyle. Everyone responds differently to whitening, and sensitivity is sometimes a side effect of whitening treatments. Ask your dental professional about using a sensitivity toothpaste like Sensodyne before and after your treatments.